Description The dust lane that runs across this fine galaxy is warped and broadened, most probably because of the tidal effects caused by the interaction with the fainter neighbouring galaxy IC 879, which itself is being distorted into an S-shape. A "bridge" linking the two galaxies can be detected here. 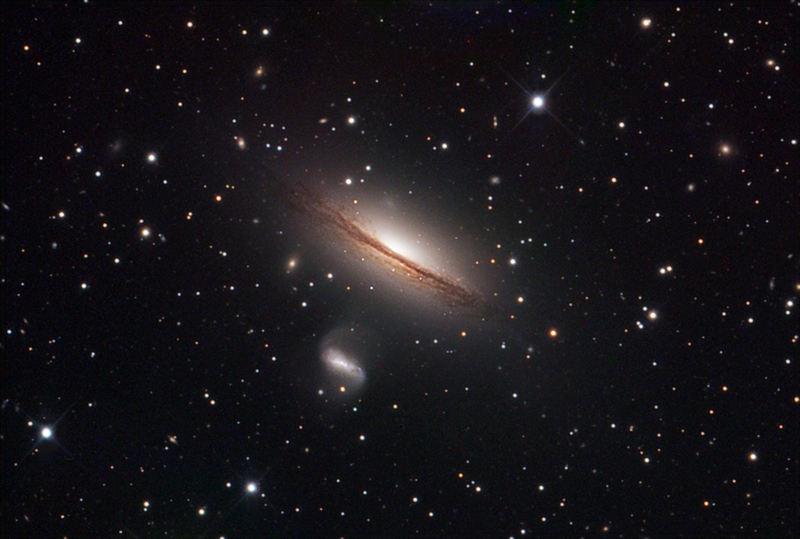 This cosmic pair lies about 80 million light years away towards the tail of Hydra and about 4° NW of M 83. Camera SBIG ST-10XE selfguided + CFW8 with Astrodon Tru-Balance LRGB filter set.